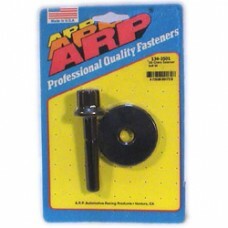 ARP damper bolt kit. As the crankshaft flexes and twists during cylinder firing, the damper absorbs incredible amounts of energy. To ensure that the damper is locked in position, ARP developed this ultra strong 200,000-psi bolt that allows for maximum clamping force. Incorporates a deep, 12-point 5/8” socket head design and 1/4" thick, wide area washer. Fits Small Block Chevrolet.